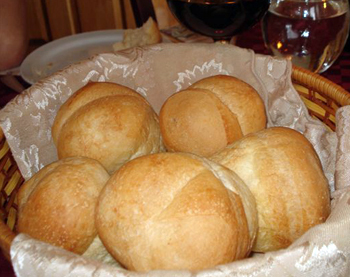 Dinner Rolls are small, individually-baked breads served along with a meal, typically the main meal of the day. They are usually served warm, in a basket lined with a cloth such as a clean tea-towel or a large napkin, whose edges are folded over the rolls to keep the heat in. Dinner rolls can be a bit of extra work when you have the rest of the meal to prepare, but dinner rolls are often the star item that guests “oooh” about, especially when the aroma hits them. The aroma is as important an aspect of dinner rolls as is the taste or appearance of them, which is why hot or warmed rolls are preferred. The aroma seems to wake up appetites. While dinner rolls to a German or Italian mind might be crusty, have a chewy or dense texture, and be made with a flour other than white wheat, to an English-speaking mind, classic dinner rolls are puffy, have a soft crust and a soft crumb, a subtle, buttery flavour, and are made from white bread or all-purpose flour. They have a light texture that is pleasing but not filling as dense rolls can be. A dinner roll should waken the appetite without being filling. These soft rolls can be universally popular with almost everyone — from toddlers to seniors. Dinner Rolls can be made in different shapes: butterhorns, cloverleaf, round, or round with split tops. To make dinner rolls, you can really just use an ordinary, soft-crumb, white bread recipe. Bread dough for a 2 pound (900g) loaf of bread will make 1 pan of 16 rolls. You divide the dough into 16 small balls, either by cutting pieces of dough off with a bread knife or kitchen scissors, or by just tearing pieces of dough off, and forming them into rounds in your (butttered) hands. You then tuck the rounds (most successful side up) into a square cake pan. If rolls are baked touching, as they usually are, this allows for soft sides. Cover with a cloth, let rise for a few hours till they double in size, then brush with melted butter or an egg wash, and bake in a heated oven. If you wish, you may brush them again with melted butter upon taking them out of the oven. Turn out of pan, and let stand on a wire rack for a few minutes before serving. For a crustier finish, when rolls are in the pan, dust very lightly with flour, don’t put a cloth over while rising, and don’t brush with melted butter after making. You can also buy ready-to-bake dough such as that by Pillsbury, in the chiller sections of grocery stores. You can make and freeze the rolls ahead of time. Thaw and rewarm to serve.